Editor/Author Gracia, Jorge J. E. and Noone, Timothy B. This comprehensive reference volume features essays by some of the most distinguished scholars in the field. Provides a comprehensive "who's who" guide to medieval philosophers. Offers a refreshing mix of essays providing historical context followed by 140 alphabetically arranged entries on individual thinkers. Constitutes an extensively cross-referenced and indexed source. Written by a distinguished cast of philosophers. 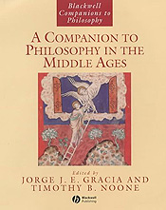 Spans the history of medieval philosophy from the fourth century AD to the fifteenth century.